If you can't decide on one flavor of pie, Pie Sisters offer various small sizes to allow visitors to sample. If your aunt’s annual Thanksgiving pie doesn’t live up to your home-cooked expectations, or if you want to continue your holiday feast when returning to the District, then you’re in luck. There are plenty of places near campus to try classic flavors, out-of-the-box options or both. On the outskirts of Georgetown, Pie Sisters is a cozy getaway from the hustle and bustle of M Street. With a warm red color scheme, the word “love” displayed on the walls and even one of the employee’s toddlers running around, the shop feels more like a home kitchen than a bakery. The store offers a variety of classic sweet pies, from cherry to lemonberry, but what makes Pie Sisters truly unique is the selection of sizes offered for those who simply can’t make up their mind. Try out a few different, delicious selections and opt for their small, sample size options – a “cuppie” ($3.75) or a “pie bite” ($1.75). The cookies and cream cuppie, served cool in a cupcake wrapper, has a tough crust and a gooey middle that tastes like a creamy version of an Oreo cookie. 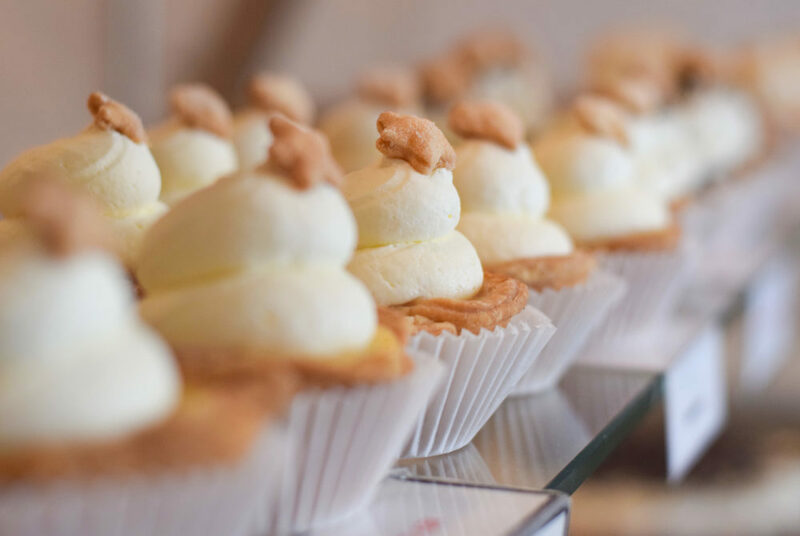 Topped with a dollop of whipped cream and crumbled cookies, the cuppie is a personal-size dessert that will have you reaching for seconds. Pie bites are the most versatile part of the menu, giving tiny tastes of Pie Sisters’ flavors baked into thin crusts. The pie bites actually take two or three bites to finish off and come in flavors like jumbleberry, a classic combination of four berries, and bourbon chocolate pecan, a twist on a classic, without the big commitment. Joe’s Seafood, Prime Steak & Stone Crab is known for high end, pricey steaks and seafood, but the menu also supplies 10 varieties of freshly baked pie. Just blocks away from the White House, Joe’s Seafood, Prime Steak & Stone Crab is a hotspot for fine dining. Chocolate-brown tables line the floor with elegant chandeliers above, providing a glimmer of light in a dark room. 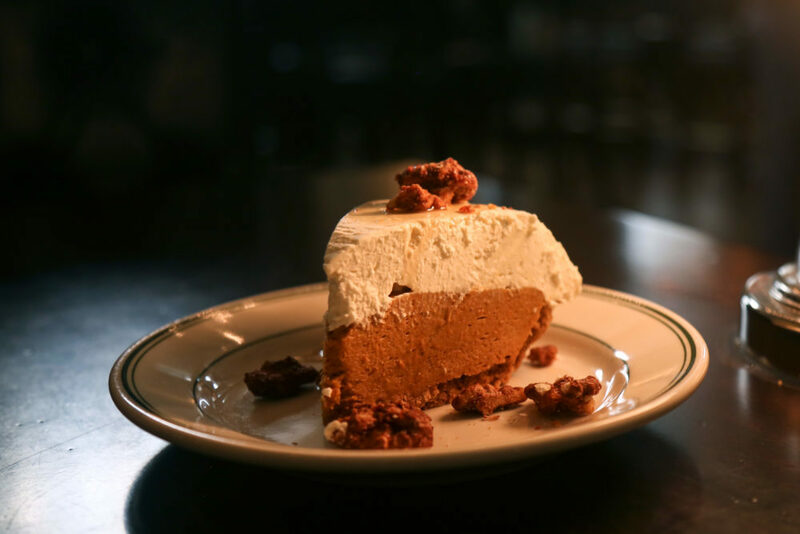 Joe’s is known for high end, pricey steaks and seafood, but the menu also supplies 10 varieties of freshly-baked pie that will cure your craving without hurting your wallet. Only a 15-minute walk from campus, in addition to offering delivery and to-go options, there’s no excuse not to grab a slice of pumpkin chiffon pie ($9.95) or a Havana dream pie ($8.95). The pumpkin chiffon pie is a twist on a Thanksgiving classic. The melt-in-your-mouth pumpkin filling is coated with a thick layer of whipped cream then drizzled with maple syrup and sugared walnuts. It’s the perfect balance of smooth filling and a crunchy topping. The Havana pie is a tres leches-like dessert stuffed into a flaky pie crust. The filling is similar to a concoction of pound cake and custard, and dressed with strawberries that make you feel less guilty about all the pie you’re about to eat this holiday season. Kramerbooks and Afterwords offers a variety of classic pie flavors in hearty slices. 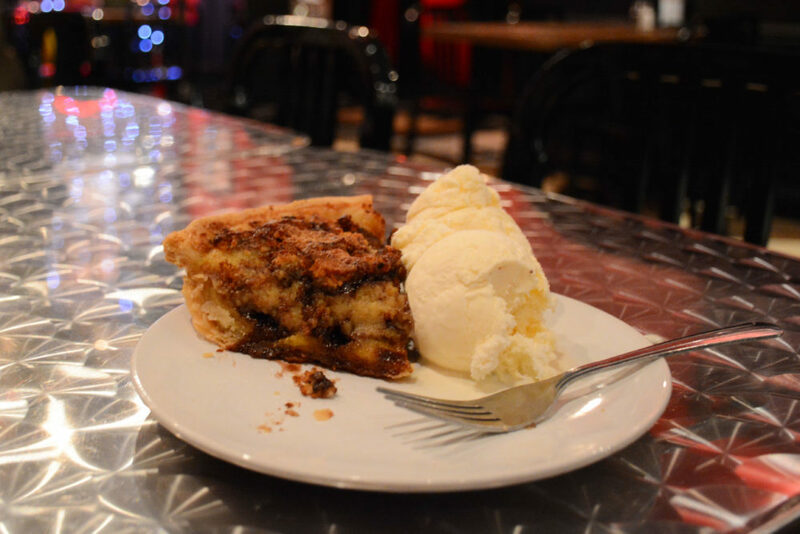 Tucked in the back of a Dupont Circle bookstore is a hole-in-the-wall cafe serving up a menu filled with dozens of desserts, including a wide variety of pies. After weaving through the bookstore to the somewhat hidden eatery, a glass case with massive slices of pie, cake and other sweet treats greet you. The menu offers sizable takes on traditional pies – like peach cobbler and key lime pie – with an added sweetness from the raspberry puree served alongside the slice. 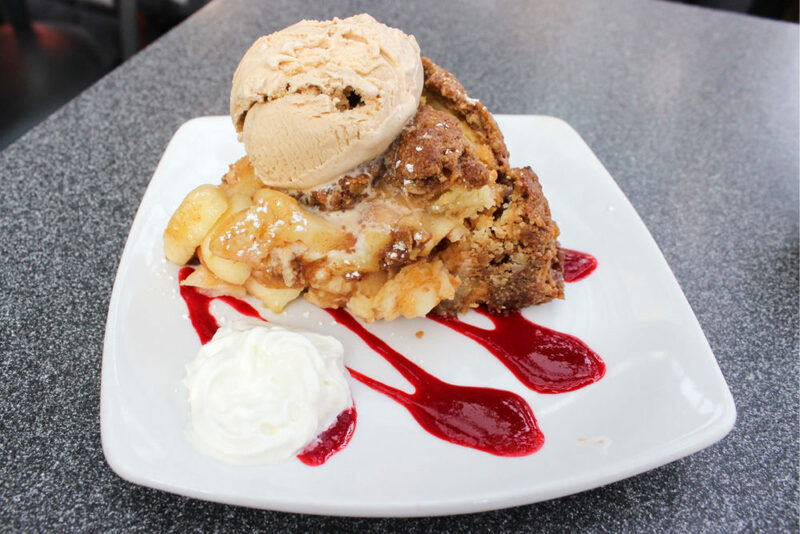 But top slices on the menu are, without hesitation, the goober pie ($7.25) and the apple crumb pie ($7.75). The goober pie features a graham cracker crust topped with creamy peanut butter filling and rich chocolate ganache. It is the definition of decadence, as the rich flavors leave you reaching for your water glass in the most satisfying way. Softened apples fill the crumb pie to the point of overflowing and are covered with crumbly, buttery topping from brown sugar and cinnamon. The pie comes with thick homemade whipped cream but for an extra indulgent treat, you can order it à la mode with a scoop of cinnamon ice cream for an extra $2.95 that is worth every cent. Whether you’re lacking a sweet tooth or want a sugary slice, Dangerously Delicious Pies offers unique flavors at two shops in D.C. and on a traveling food truck. Whether you’re lacking a sweet tooth or want a sugary out-of-the-box slice, Dangerously Delicious Pies offers unique flavors at two shops in D.C. and a traveling food truck. All locations serve a rotating menu of traditional flavors like apple or chicken pot pie. But among the classic favorites, the shop’s stand outs are original flavors like pancake batter for a sweets lover or ratatouille for those looking for a meal. The Baltimore Bomb pie ($6.50) comes in a wide slice stuffed with Baltimore’s famous berger cookies – cake-like cookies coated in a thick layer of chocolate fudge. The slice is served hot out of the oven, making the chocolate cookies melt together into a sweet filling. For a savory option that goes beyond anything you could make at home, the hot rod potato ($8.50) is a thick braided crust with crispy baked potato pieces and sliced onions laced with melted cheese holding it all together.